Danny is having a sad kind of a day. His favorite big brother is at school and his favorite big sister is at a friend's house. He would play with Taylor, but she isn't listening to his bossing so what fun is that? 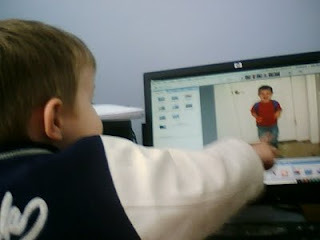 I told him that he could help me on the computer, that he could pick pictures and we'll tell our friends about them. So, here we go. Daniel, what's this a picture of? "Mine. Me. Wooking at me. I hafs a packpack." "My Jeep! My Jeep gone. Jeeee-eeeeeeeeeeep! Jee-eep! Where are you?" sob. sob. "Mom, my Jeep is wost... Mom? I go pee there?" "I no look at me. I find Jeep." Daniel, look, what's this a picture of? "Me ride my bike. Ow-side now? Bye. I ride my bike. Me done. ME DONE! OW-SIDE!" And that concludes today's pictorial. We will be outside if you need us.